This news dates back to March 16, but I just recently found the picture that truly drives it home. This time last summer I was in Guadeloupe working with a group of students from VISIONS Service Adventures on a project to convert an open-air pavilion into a tourist welcome center for the small island of Terre-de-Bas. We left the project substantially built but unfinished — lacking paint and many finishing touches. Well, the local community stepped up to finish the job in style. 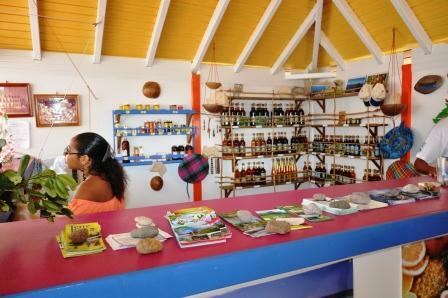 The new tourist welcome center was inaugurated in March, in a ceremony that included the mayor of Terre-de-Bas, Fred Beaujour, and one of the mayors of a large neighboring island. Here’s the best picture that I’ve been able to find so far. It looks great. If anyone else has pictures, perhaps from this year’s VISIONS trip, please let me know as I would love to post them here!